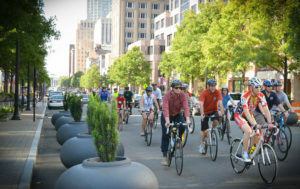 This May, BikeWalk NC encourages you to celebrate National Bike Month! In 1956, the League of American Bicyclists made Bike Month official. This is a prime opportunity for people of all ages to gather for events ranging from festivals to group rides to educational sessions, all inspired by the shared love for bicycling and the desire to help spread this love to others. The month offers opportunities to explore your community and the many reasons people choose to ride. It is an excellent chance for people to get motivated to go out and ride with others. Be sure to keep an eye out for a Bike Month event in an area near you, or take the initiative to travel somewhere new for an alternative experience! Several places in North Carolina are celebrating, and we have compiled a list of some of these wonderful festivities. If you are responsible for your area’s events, email us at Contact@bikewalknc.org and we can add to this list and have your contact for next year. May 1-18: Commute Challenge: Individuals and businesses are invited to sign up for the Commute Challenge, which will allow them to log their active, transit and carpool commuting miles on Share The Ride NC and unlock free goodies. May 20: Tour de Fat festival featuring artist Third Eye Blind at New Belgium Brewing, 4 p.m.
A link for all the events in the Cary area can be found here. May 17: Ride of Silence leaves from back parking lot of the Myers Park Traditional Elementary School, 7 p.m.
May 27: Tour de Fat festival featuring artist A Thousand Horses at the Charlotte Metro Credit Union Amphitheatre, 4 p.m.
May 6: Durham Bike Co-op 10-year anniversary ride, 4 p.m.
May 17: Ride of Silence. Leaves from the Bull Statue (CCB Plaza) at 7 p.m.
May 5: Bike Downtown for Open Streets, 6 to 9 p.m.
May 7: Wheels on the Greenway will have music, food and a variety of activities for adults and kids. 2 to 4 p.m.
May 13: Bikes & Brews Pub Roll. Leaves from 298 Spring Garden St., 2:30 to 5:30 p.m.
May 17: Ride of Silence. Leaves from the Forge at 219 W. Lewis St., 6 to 8 p.m.
May 19: Celebrating New Bikeways Ride. Leaves from Deep Roots Market, 600 N. Eugene St.
May 6: Bike MS Picnic & Ride at Anderson Point Park from 11 a.m. to 2 p.m.
May 16: Bike/Walk/Bus Listening Session with Raleigh’s DOT at the Chavis Community Center from 6 to 8 p.m.
May 17: Ride of Silence to honor those who have been injured or killed while bicycling on public roads. Starts in Dorothea Dix Park at 7 p.m.
May 20: Dorothea Dix Park Ride starts at Eliza Pool Park, 8:30 to 10:30 a.m.
May 20: Six Park Metric Century Ride hosted by Cape Fear Cyclists, 7:30 a.m.
May 4: Temple Emanuel Environmental Movement Movie Night, 7 p.m.
May 6: Electric Bike Forum and Ride, 8:30 to 11 a.m.
May 13: Bike Safety Day will educate children about the importance of bicycle safety, 10 a.m. to 2 p.m.
May 13: Bike-In Movie of Pee Wee’s Big Adventure, at Bailey Park, 8:30 p.m.
May 17: Ride of Silence. Leaves at Foothills Brewing Company, gather at 6:45 p.m.
May 20: Forsyth Off Road Bike Association Tanglewood Park Mountain Bike Trail Work Day, 8 a.m. to 12 p.m.
May 20: Clemmons Pedal and Metal Fest 2017 at Morgan Elementary School, 11 a.m. to 2 p.m.
May 29: Walk & Roll Winston-Salem, 1 to 4 p.m.